Beyond the halfway point in my first exploration of Sugar Loaf mountain hill, I’d reached the hamlet of Llangenny and was looking for a place to stop for lunch. 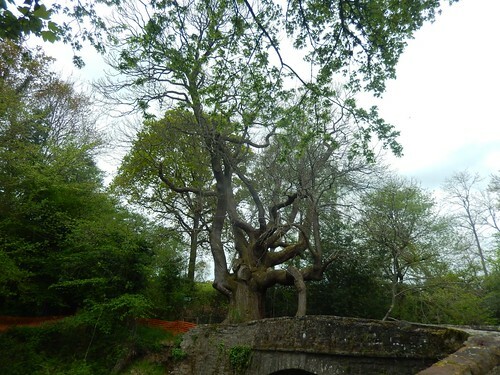 I’d hoped to stop somewhere near to Millbrook Bridge, beneath this towering old tree. But there were already a couple of people paddling in the river beneath me and I was craving something more in the way of solitude. Following the river, I would continue. This entry was posted in Wales and tagged Black Mountains, Brecon Beacons, camp site, grwyne fawr, hiking, hill, Llangenny, mountain, Mynydd Pen-y-fal, river usk, standing stone, Sugar Loaf, The Sugar Loaf, trig pilllar 80, trig point, Wales, Walking on 12/06/2017 by Olly Parry-Jones.